Fast service, a no brainer for replacing keys. Ive used them for 4+ years with 3 vehicles... highly recommend! Very fast and helpful! I went there to change my smartkey battery and they changed it in seconds. Also the prices are way cheaper than any car dealership. Definitely recommended! 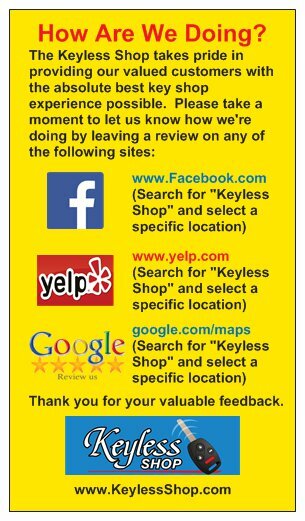 Check out the hundreds of Facebook reviews for The Keyless Shop. The keyless shop is great! Made me a duplicate key from my key! Very reasonable and excellent service! I highly recommend them! - Karen H.
My key was broken and they’ve cut me a new one within 20 minutes! Prices were the best I’ve found in the area! - Hakim R.
Fast knowledgeable kind service. They took time to answer all my questions. - Amber W.
This has got to be the greatest experience I've ever had with any locksmith company. The first key that I received was defective, so the gentlemen requested that he would be sure to give me another key free of charge. 5 days and 3 defective keys later, they were finally able to replace my key and then some! They even gave me a couple of spares after having traveled to another location an HOUR away just to use a different machine for precaution's sake! Definitely a company worth recommending to others. -Scottie B. 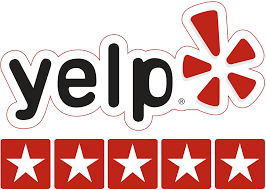 Please take a moment to let us know how we're doing by leaving us a review on Google, Yelp or Facebook. Thank you for your valuable feedback.